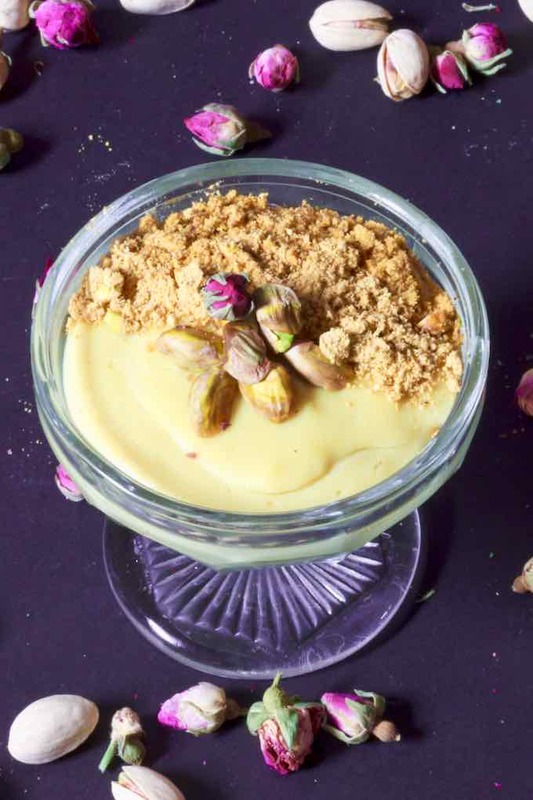 Krima tounsiya is a deliciously creamy custard-type Tunisian dessert, flavored with rose, geranium, or orange flower water, and often elaborately decorated with rosebuds, silver dragées, and dried fruits, plus ground and whole pistachios, hazelnuts, and almonds. Never let it be said that Tunisians shy away from dessert – or anything sweet, for that matter! 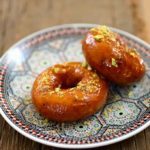 Right across the Maghreb, Levant, and Middle-East, you’ll find a veritable treasure trove of wondrous sweetmeats, cookies, pastries, and puddings. And they are inevitably beautifully decorated too. Sometimes the decorations are simple, sometimes incredibly extravagant… but always impressive enough to give you a “Whoa!” moment when you first see them! Like many other countries where fruit grows abundantly (e.g. Turkey, Thailand, Morocco, India), everyday dessert in Tunisia is generally fruit-based, be it plain or prepared in some way. 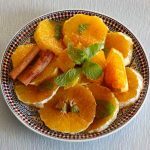 For example, this beautiful orange and cinnamon salad from Morocco. 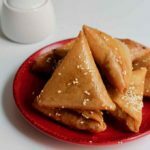 Elaborate desserts and pastries, such as bjawia, griouech, makroud, and of course, the ubiquitous baklava, are traditionally made and served for celebrations and to welcome guests into one’s home. That said, it’s not unusual these days to see them on the shelves of every patisserie on every street corner in North Africa. 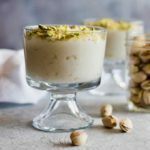 Since Tunisia is a predominantly Muslim country, in addition to the usual family celebrations of homecomings, babies, birthdays, and weddings, practically every month in the Islamic calendar has a reason to feast, and therefore, a prime opportunity to delight the senses with indulgent confections! Flower waters, such as geranium, rose, and orange have been used since time immemorial to flavor desserts, cakes, syrups, beverages, and pastries (e.g. 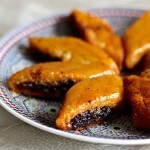 samsa) from Asia to the Mediterranean. In Arab cuisine, orange blossoms, being white and somewhat delicate, are a symbol of purity, and so in addition to being a traditional bridal flower, are used to flavor food at marriage feasts. 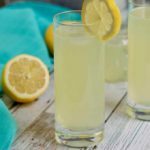 Orange blossom water is also added to plain water for drinking to disguise the not so pleasant flavor that comes from having such a high mineral content. When I lived in Morocco, I actually added it to bottled water because I loved its subtle hint! Geranium flower water is a bit of a misnomer because it’s actually the pelargonium which is used for culinary purposes, and not geraniums at all! The most common pelargoniums to use are rose, lemon, and mint. As with orange blossoms, the pelargonium flowers are distilled to make fragrant waters to add to sweet dishes. In addition, both the flowers and leaves may be dried, crushed, and added to food, vinegars, and teas. Fresh pelargonium leaves may be used to flavor cakes by lining the base of a cake pan, then pouring the batter over the top. The leaves are discarded once the cake has been unmolded. 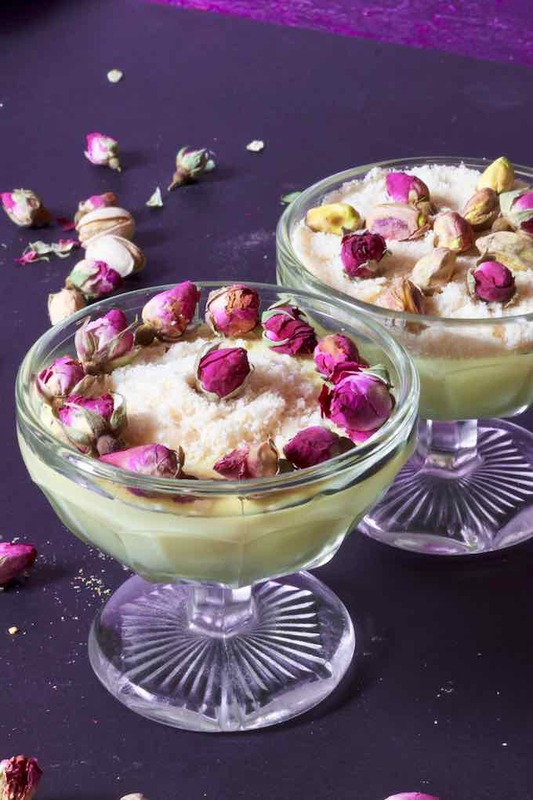 The use of roses for both culinary and medicinal purposes, as well as cosmetic, dates back to the ancient world, with rose water itself being a by-product of attar of roses (rose oil). The Phoenicians considered roses to be as important as wheat and fruit, and like their Roman and Greek counterparts, cultivated large municipal rose gardens. Some of the most famous uses of rose as a flavoring are Turkish delight, gulab jamun, and biriyani. What is the difference between custard and pastry cream? 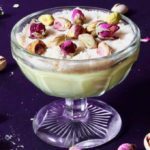 Technically, a custard is solely thickened with eggs, and can be thick and set, usually in chilled dishes, such as trifle and floating islands, or thinner, and used as a sweet pouring sauce, known outside Britain as crème anglaise (we just call it custard!). When a starch is added as a further thickener – e.g. cornstarch, rice or all-purpose flour – it becomes crème pâtissière, also known as crema pasticcera, pastry cream, and confectioners’ cream. This forms the basis for the Portuguese pasteis de nata, French éclairs, and quindim from Brazil. By the way, m’halbi, muhallebi, malabi, and muhallabia are all similar to krima tounsiya – the difference being that rice flour is used instead of cornstarch, and no egg yolks are used. Krima tounsiya is really easy to make, although of course, different cooks have their own way of doing things: some whisk all the ingredients together, and then heat, while others heat the milk, and make a paste with the sugar, eggs, and cornstarch, which then gets added to the milk. Some cooks don’t use egg yolks, while others do. I’ve made it both ways, and not only do the egg yolks give the krima tounsiya a golden hue and a bit of a glossy finish, they also add a creamy richness to the dish. Plus, extra protein too. 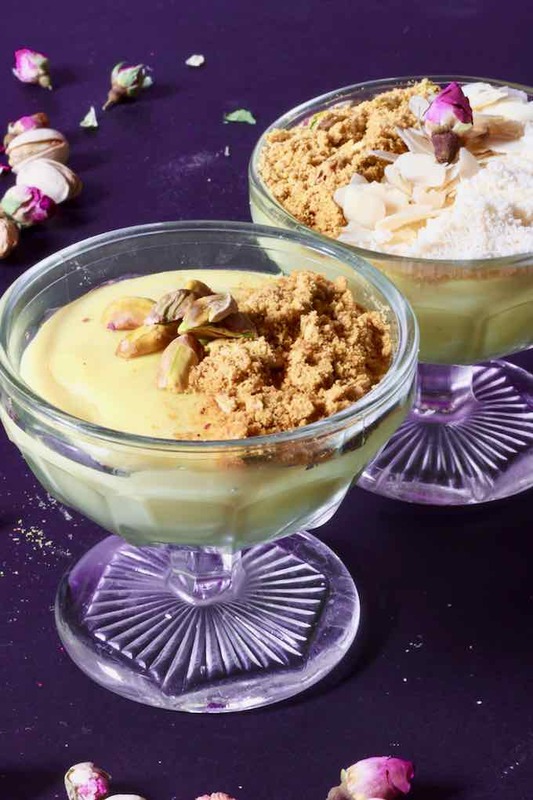 If you enjoy custard-type desserts and floral flavors, you’re in for a real treat with this krima tounsiya! Reserving 2 tablespoons, pour the milk into a heavy-bottomed saucepan over a medium heat. While the milk is heating, whisk together the sugar and egg yolk until pale and fluffy, then beat in the cornstarch and the reserved milk until you have a smooth paste. Pour the paste into the milk, and whisk continually, until the custard starts to boil. Reduce the heat to medium-low, and simmer - whisking occasionally - for around 10 minutes, until thick, and the cornstarch has cooked in. Whisk in the rosewater, turn off the heat, divide into suitable bowls, cover with a clean damp tea towel (to prevent skin forming), and set aside for an hour to cool down. Decorate the top as desired, and serve cold. Krima tounsiya will keep in the fridge for 4 to 5 days. It is not suitable for freezing.